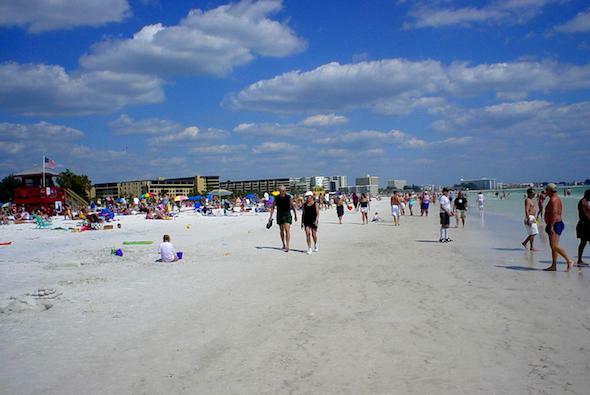 Named one of the best beaches in the United States, Siesta Key Beach is also great for running. The white sand is firm and optimal for running, especially at low tide. The main part of the beach is just short of 3 miles one-way. The overall beach is nearly 8 miles, but Crescent Beach Turtle Beach, which are reached after a stretch along the road, are not as good for running. Best access for parking is at the northern end, in Siesta Key Village, where there are also lots of shops and restaurants. This is mainly a beach run, as there’s not a road or path that parallels the beach (at least with views). Best parking is in the village.